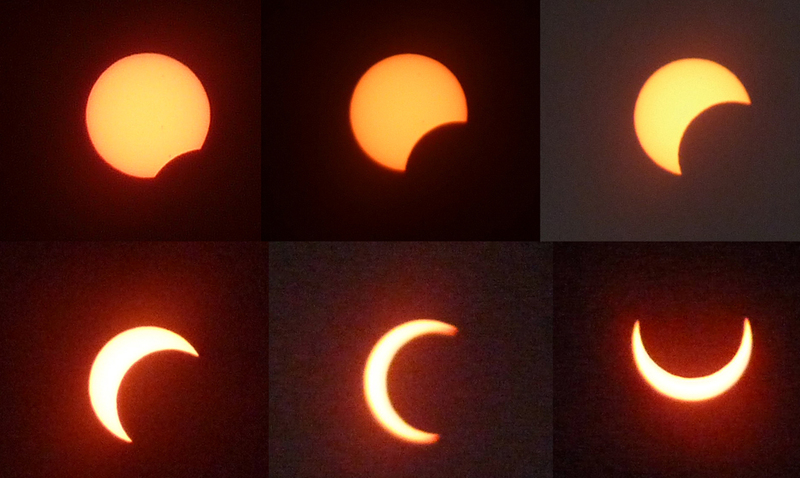 On May 20th, 2012, our area of Northern California was treated to a partial solar eclipse. After nabbing some eclipse viewing glasses from work, courtesy of NASA, I was excited to share this experience with my kids – they had seen lunar eclipses before but never a solar eclipse. We watched from our driveway – I’d previously checked to make sure that the Sun was still visible from our house at 6:30 PM, and it was (though it went behind a big tree around 7:00 PM). I thought that for the kids, in particular, that it would be a good experience to view the eclipse from our own house, rather than going to an isolated viewing site or event, to help them realize that a solar eclipse was something that happened all over the area. As it turned out, watching the eclipse from our driveway turned into a great community event as well. We first went out at first contact, around 5:30 PM. The kids were excited to try out their glasses, and sure enough, you could see a small nick out of the bottom right side of the Sun where the moon was just beginning to cover it. We let some neighbor kids look through the glasses as well, and encouraged them to come back out in an hour when it would get even more spectacular. As the eclipse got deeper and deeper, we went outside about every 10-15 minutes to take pictures and look through our glasses. My partner Shana quickly figured out how to take excellent pictures by just placing one side of a pair of eclipse glasses over the lens of our digital camera, and so she documented the progress of the eclipse as it progressed towards our local maximum. 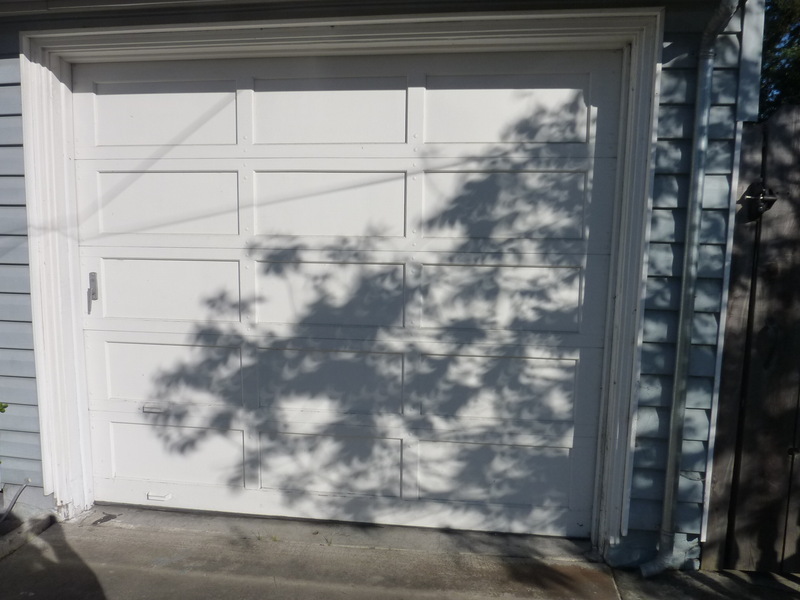 By about 6 PM, we began seeing crescent-shaped projections of the Sun cast through leaves on the trees onto flat surfaces such as the side of our house and our neighbor’s garage. These occur through something similar to a pinhole camera – the sunlight is focused through small holes between the leaves, and the rays spread out on the other side, producing an image of the Sun. This happens all the time, of course, but since the sun is usually shaped like a circle we never notice it – it’s only during an eclipse that the effect becomes spectacular. 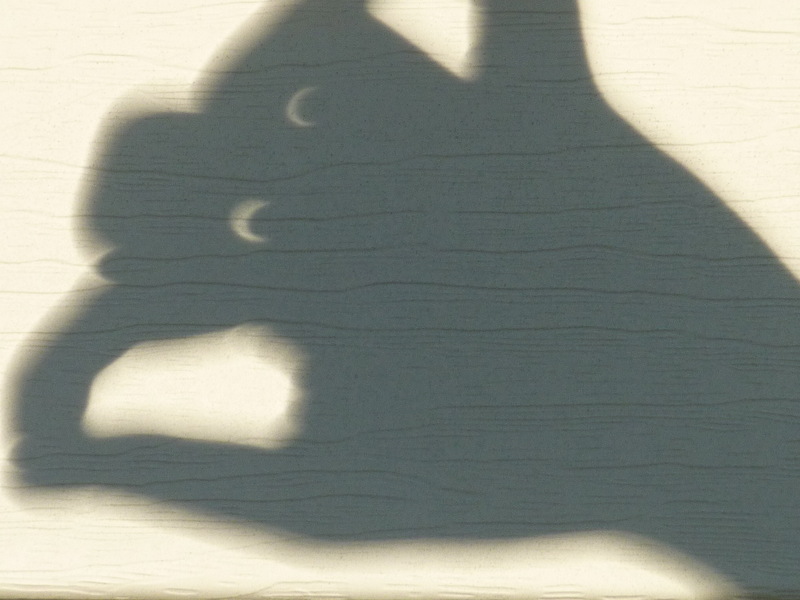 We had a good time playing with casting shadows and looking for eclipse crescents – we found that a small hole in a piece of aluminum foil worked well, but that you could also just use your fingers! We pointed out eclipse projections to our neighbors, who were beginning to come out of their houses as we approached the maximum. We knocked on the door of our elderly neighbor and encouraged her to come look through a pair of our glasses – she was impressed, and had never seen an eclipse before! More and more people started coming outside, and we shared our glasses with them – people would be dubious at first, looking through the glasses just to humor us, and then once they saw the eclipse they were very impressed and went inside to get other family members to take a look! 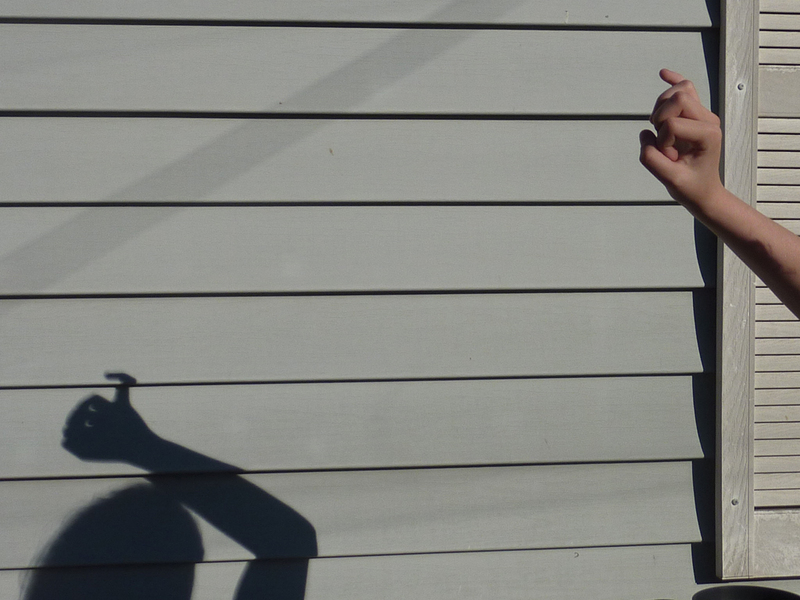 See the tiny eclipse shapes in the hand shadow? I spotted one neighbor who was trying to take photos with a camera looking through 3 layers of sunglasses – he was glad to try using a pair of eclipse viewing glasses instead, and we pointed out that was a lot safer. It was particularly fun sharing the glasses with kids, who would then run inside to get their parents to take a look. We met many neighbors that I’d only had a passing acquaintance with previously, or had just waved at in the past – the eclipse proved to be a great way to connect with them, and I was gratified at how many neighbors stayed outside afterwards to look for eclipse shadows. At maximum coverage, the sky definitely looked weird – the ambient light levels were darker, and the light had a very attenuated, almost blue-ish, cast to it. It seemed like early dawn, even though the sky was fully blue and the sun still fairly high above the horizon. The temperature in the sunlight was noticeably cooler, as well, and the wind picked up. Since we weren’t in the path of the annular eclipse, we instead got an interesting rotation of the crescent as the Moon passed across the central side portion of the Sun and off to the top left. I spotted some neighbors just pulling up in their car, and offered them a view- turns out they’d just come back from an eclipse viewing party at a local park, which was gratifying to hear about, where someone had constructed a pinhole camera to watch the eclipse. They, and their kids, were happy to look through viewing glasses so they could see the sun directly, as well. Planetary scientist at the SETI Institute. This was the fourth solar eclipse that I’ve seen, and one of the better ones. I’m glad the weather held out here! We met some friends at a park where there was a good vantage point. It was amazing how many people were just there, walking around, not knowing what was going on above them. Thanks a lot for this first post Cynthia.